Pictured front row (l-r): Raelynn Rubble, Philemina Toca, Mia McCammon, Jessy Mullenix and Mae Quiley. Second row (l-r): Andre Cumberland, Gavin Frazier, Quinn Brown, Ashlynn Yates, Daniel Bohl, Audrey Merry, Miranda Lawhorn, Brooklynn Laymon and Austin Wilkin. Third row (l-r): Robbie McIntosh, Alana Miller, Cat Knope, Conner Tyree, Hunter Balon, Dawson Osborn, Cole Parker and Nathan Brown. 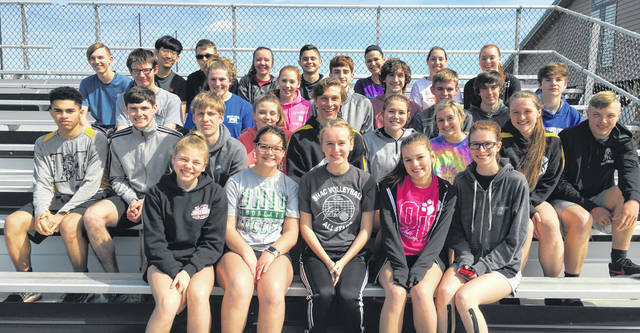 Fourth row (l-r): David Burton, Tony You, Draiden Doughman, Jennifer Zwielser, Tristan Wiederhold, Abigail Brioli, Allison Kohus and Serene Walker.